It’s not that castor oil has a bad reputation. But when a product is known as a cure for constipation, well, it can get stereotyped in the minds of consumers. 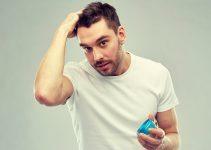 But there’s more – much more – to castor oil beyond its benefits for keeping a guy or a gal regular. Like, for instance, castor oil for hair growth, which we’ll cover in this post. We’ll take a look at the best castor oil for hair growth – including our top pick, USDA Organic Cold-Pressed Castor Oil . We’ll also investigate the reasons why castor oil is good for hair (and skin) health, but let’s begin by looking at some castor oil buying tips. There are a few things to keep in mind now that you’ve decided to try castor oil for hair growth. Choosing the right oil can mean the difference between no results and a fuller, healthier head of hair. You’ll see and hear the phrase cold-pressed a lot when researching castor oil. What it refers to is the extraction process of the oil; in the cold-pressed process, the oil is extracted directly from the castor seed without heat. While heat-pressing is common, it can degrade the nutrients present in the seed. Cold-pressing assures that all nutrients remain during extraction. Cold-pressed castor oil is pale yellow. The Jamaican Black Castor Oil process involves roasting seeds and then pressing them for oil. The ashes created by the roasting process are mixed with the oil and give it its black color. Jamaican Black Castor Oil has the same nutritional value as organic cold-press oil, but higher alkalinity. Hydrogenated castor oil comes from hydrogenating pure castor oil with the aid of a nickel catalyst. Also known as castor wax, hydrogenated castor oil is odorless, brittle, and insoluble in water. Note: You’ll find hydrogenated castor oil in many cosmetics, varnishes, and polishes. Pure castor oil is free from artificial ingredients and you should look for one whenever possible. “Pure” means that it doesn’t contain artificial ingredients such as fragrances, alcohol, or other enhancements, because these ingredients may dry out or irritate your skin. Look for products with the USDA Certified Organic label. An organic product uses natural ingredients and doesn’t include synthetics. Truly organic castor oil comes from seeds grown in a natural environment without the use of fertilizers or growth enhancers. Buy your castor oil from authorized sellers only – such as well-known pharmacies and health stores. If you’re buying it online, make sure that you’re purchasing it from a reputable e-commerce site such as Amazon. If you have doubts, check the brand’s website and browse the reviews of others who’ve used the product. High-Quality castor oil has a thick, yellowish texture and color and a nutty odor. AA Standard (or “pale pressed”) that comes from the first pressing of the seed and what many people refer to as virgin oil. This oil may be diluted and thin, so make sure that it’s cold-pressed for the highest quality. Industrial (or “imported”) which refers to the process of mixing the first pressing with the next batch of seeds. This process repeats multiple times. Hexane is a solvent used to extract oil from seeds, including from castor oil seeds. Like any chemical solvent, hexane may introduce impurities to the process that affect the integrity of the oil. Your best bet is to choose products that don’t include hexane. Next, let’s dig into the best castor oil for hair growth and our castor oil for hair growth reviews. 100% natural and organic ingredients? Check. Hexane and artificial additives-free? Check. That’s not all to like about the Organic Cold-Pressed Castor Oil, mind you, but it certainly represents the foundation of what we think is the best castor oil for hair growth. Because it’s cold-pressed, this oil’s nutrients and healing properties remain fully preserved. Artisanal farmers in India handle the extraction process without using heat or chemical substances such as hexane. In turn, you’re safe from skin allergies and other irritations. What this oil does include, however, are essential fatty acids, vitamins, and minerals that nourish and strengthen the hair while giving it a nice shine and while repairing split ends. It has other uses, as well, especially as a skin moisturizer and for building and maintaining healthy nails, and for helping eyelashes and eyebrows grow longer and thicker. While castor oil replenishes the scalp’s natural oils it also contains antioxidants that support keratin, which helps make hair stronger and smoother. Meanwhile, a high concentration of vitamin E repairs split ends, while the oil also promotes blood flow to the scalp which, in turn, helps trigger hair growth. Another thing we like is that the Organic Cold-Pressed Castor Oil comes with a 100% money back guarantee. If you aren’t satisfied with its results, send the oil back for a full refund with no questions asked. The oil is also cruelty-free and never tested on animals. There is a multitude of ways to apply this oil to your hair – and we’ll go in greater detail about it later – but one way to use the Organic Cold-Pressed Castor Oil is to mix it with your favorite conditioner (with 20% of the mixture containing castor oil). More than a few customers swear by this oil as a way to promote hair growth while preventing hair loss, and with good reason. It works, and it’s versatile, as well. ArtNaturals earns high praise for being one of the leading names in castor oil, and it’s well-deserved. After all, the company strictly adheres to its mission to produce all-natural products that are good for your hair and skin. The ArtNaturals Pure Organic Castor Oil comes from 100% cold-pressed virgin oil directly sourced from Jamaica. The cold-pressing process means that no parabens and other potentially harmful chemicals get used in the extraction process. ArtNaturals Pure Organic Castor Oil comes in a clear plastic bottle that has a peel-off seal which lets you know that the oil is contaminant-free. As mentioned, the oil is chemical-free and never tested on animals. Art Naturals’ mission is to create high-quality, natural products while offering them at an affordable price. Like most quality castor oils, the ArtNaturals Pure Organic Castor Oil absorbs quickly into the skin to rapidly deliver its therapeutic, hair-health benefits. ArtNaturals lives up to its reputation for creating quality hair and skin products made from natural sources with its Pure Organic Castor Oil. 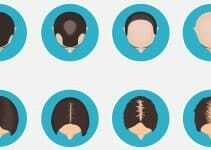 It works quickly to address hair loss and hair regrowth while also serving a variety of other health purposes. Jamaican black castor oil is another oil that’s showing up more often in hair-care products. Basically, it’s derived from oil extracted from roasted castor beans while adding the black ashes produced during the roasting process. While it has the same “nutritional” value as organic cold-pressed oil, Jamaican black castor oil has higher alkalinity. The stuff works for hair growth, however. One of the best Jamaican black castor oils on the market comes from Tropic Isle Living. It’s certainly one of the best-known, but it earns its attention thanks to customers who’ve experienced positive results when using it. It nourishes and hydrates dry, dull skin, is good for use on your eyebrows and helps treat fingernail growth by treating nail fungus. The Tropic Isle Jamaican Black Castor Oil comes either in an 8-ounce pet-safe plastic jar or a glass bottle. The folks at Tropic Isle recommend adding their oil to a hair conditioner, massaging the mixture in the hair and scalp, and then rinsing it thoroughly after letting it sit for up to a half-hour. Many consumers swear by Jamaican black castor oil and Tropic Isle’s product is among the best. It serves multiple purposes for your hair, not the least of which is promoting hair growth. NOW Castor Oil gets a lot of mention as a skincare product, but it also provides an excellent solution for kick-starting hair growth while limiting hair loss. Made of 100% pure organic castor oil, NOW Castor Oil comes from an expeller-pressed process. Expeller-pressed refers to a specific mechanical option that squeezes oil from the bean. None of NOW Solutions products include harsh chemicals or synthetic ingredients, and their castor oil is virtually odorless. Because it’s chemical-free, NOW Castor Oil is easy on the scalp and won’t dry out hair or make it brittle – and it’s gentle enough to use on your face body, hair, and scalp. The NOW Solutions line also includes anti-aging moisturizers and serums, bath and body gels, shampoos, oral care products, and more. They’re committed to the evolution of safe, effective personal care products and their Castor Oil aptly represents that commitment. When it comes to reviews of castor oil for hair growth, NOW Solutions’ signature product always pops up. It’s a good all-around product that keeps your scalp and hair healthy and thriving. Wild Nest Organics is another company committed to providing natural and organic grooming products that get great results without using chemicals or other potentially harmful ingredients. In other words, it comes straight from the seed directly to you. The Wild Nest Organic Castor Oil is also cold-pressed and has multiple uses – as a good castor oil should. Is also USDA-certified, which is a good thing, too. While the consistency of Wild Nest’s castor oil is thicker than other brands, it’s easy to apply and doesn’t feel greasy on your scalp or skin. It comes with an applicator kit that makes it easy to apply drops of it to the affected areas of your scalp. Oh, and it also comes with an e-book that sings the praises of castor oil. 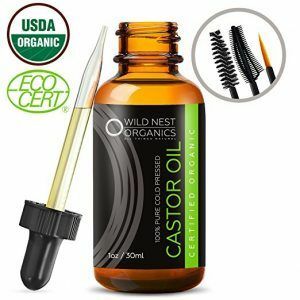 Wild Nest’s organic castor oil stacks up with the rest of the best for hair growth and other uses, including skincare. You’ll reap the benefits of castor oil for hair growth and more. There’s no one “right” way to apply castor oil. You’ll find almost as much information about methods for applying castor oil than you will info about various castor oil products. First of all, you don’t want the oil staining your clothes or getting all over your work area. 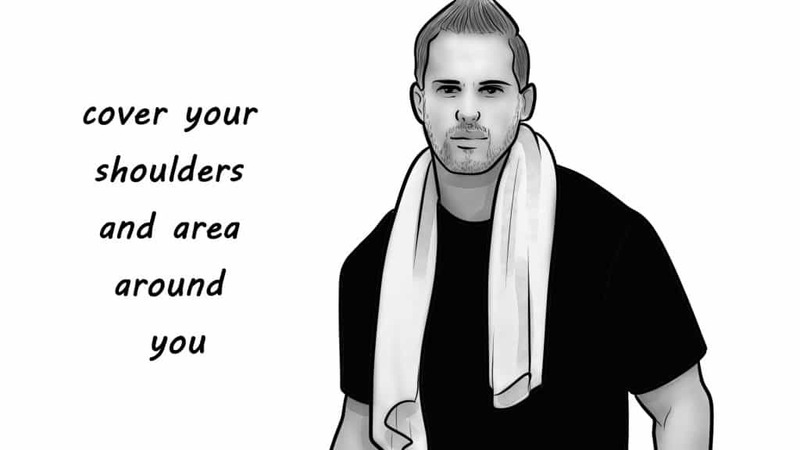 So, use paper towels or old towels to cover the area around you and to cover your shoulders so that the oil doesn’t get on your clothes. You should do this every time you use castor oil, but especially if you’re using it for the first time. Things can get a bit messy if you’re not careful. While you can apply castor oil to dry hair, most experts recommend dampening it first to help absorb the oil better. 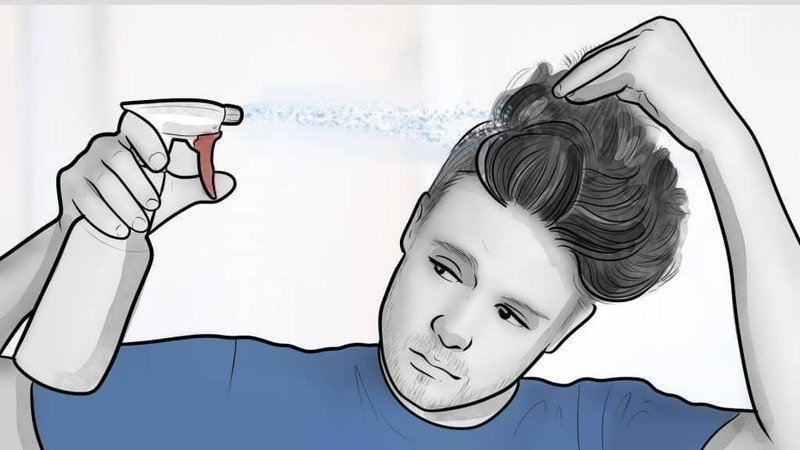 The easiest method is to fill a spray bottle with water and then spritz it on your hair to keep it damp. Also, comb or brush your hair before applying the oil to get rid of any tangles or snags. One thing to keep in mind is that you don’t need to use a ton of castor oil for it to benefit your hair and scalp. 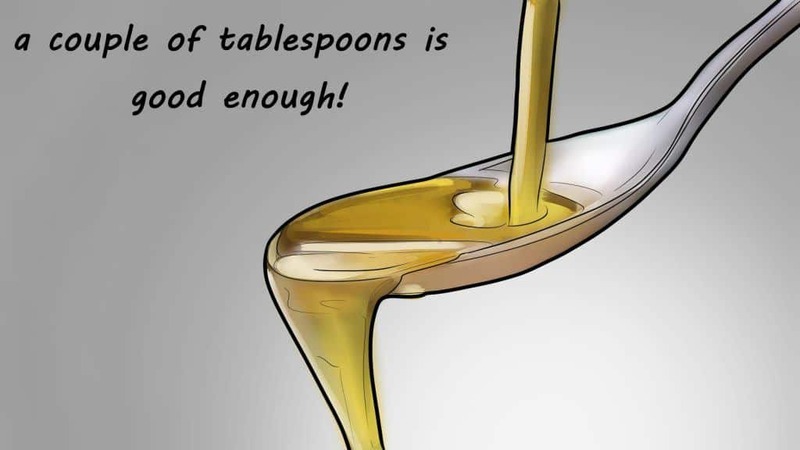 In most cases, a couple of tablespoons is enough, so your bottle of castor oil should last you for a fairly long time. Another beneficial practice is to heat the oil before applying it to your hair. Warming the oil will help draw out its beneficial ingredients and make it easier to apply. A good strategy is to mix the oil with another oil, such as jojoba, argan, coconut, avocado, or sweet almond oil. Doing so also makes it easier to apply. Additionally, adding a few drops of essential oil such as rosemary, peppermint, or tea tree helps mask the stronger smell of the castor oil. For instance, you could create a mixture of castor oil (3 tablespoons), jojoba oil (1 tablespoon), and coconut oil (1 tablespoon) in a small jar and shake the ingredients together. To heat the oil, you can fill a bowl with very hot water and then place the jar of castor oil and other oils in the water (while making sure that no water gets into the jar). Once the oil has warmed, you can place it in a small bowl so that it’s easier to apply. Or, you can use an eye dropper to draw the oil from the jar. 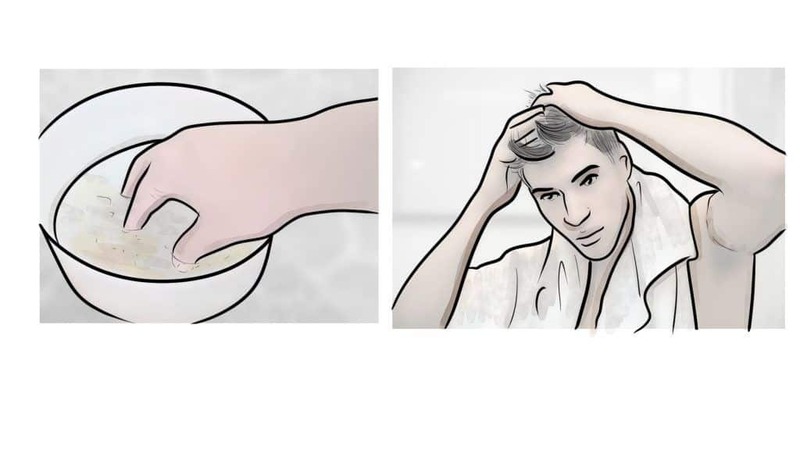 Once you’ve placed the oil in a bowl or another container, dip your fingers into it and massage it into your scalp for three to five minutes. 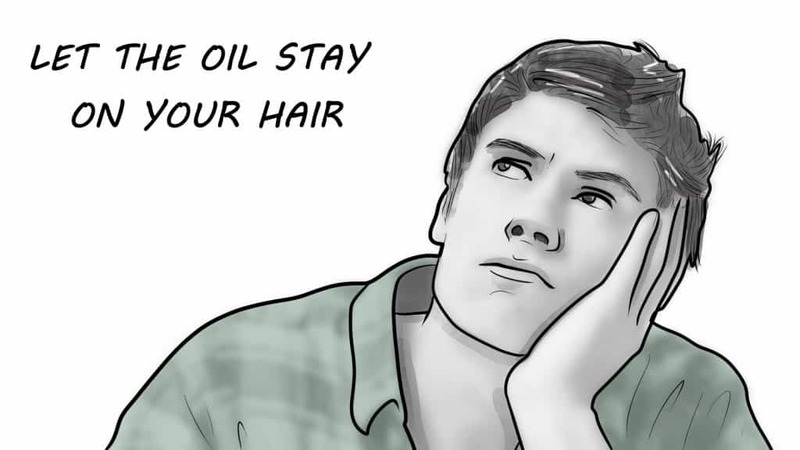 You don’t need to use a lot of oil because a little of it goes away, but do make sure to spread it evenly between your hair roots and across your scalp. Use small circular motions with your fingertips to massage the oil. If you’re using an eye dropper, apply a few drops to various areas of your scalp – which may be a bit less messy than applying it with your fingers. Whatever method you choose, massage the oil into your scalp for three to five minutes to ensure that you’ve evenly distributed it throughout your scalp. Don’t wash the oil from your hair immediately after you’ve applied it, but let it remain on your scalp for at least 15 to 20 minutes. You can also leave it on overnight if you wish, but make sure to protect your pillow with a covering or case of some kind, or wear a shower cap or towel on your head. If limiting hair loss and spurring hair growth is your goal, you should apply castor oil to your hair at least twice a week and even up to three to four times per week. Castor oil is thick – and sticky – by nature, so washing it off your hair and scalp requires a bit of effort. One of the keys to doing it effectively and without damaging your hair is to use warm water – at first. Doing so opens the pores of your scalp to release leftover grime and dirt. Work your favorite shampoo into a generous lather and massage it gently into your scalp with your fingertips before rinsing with lukewarm water. Again, you can also leave the oil in for several hours or overnight if you so choose. 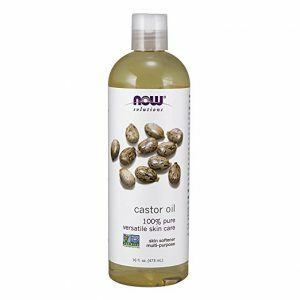 So far, we’ve talked a lot about it castor oil, including the best castor oil products for hair growth, how to apply it, etc. 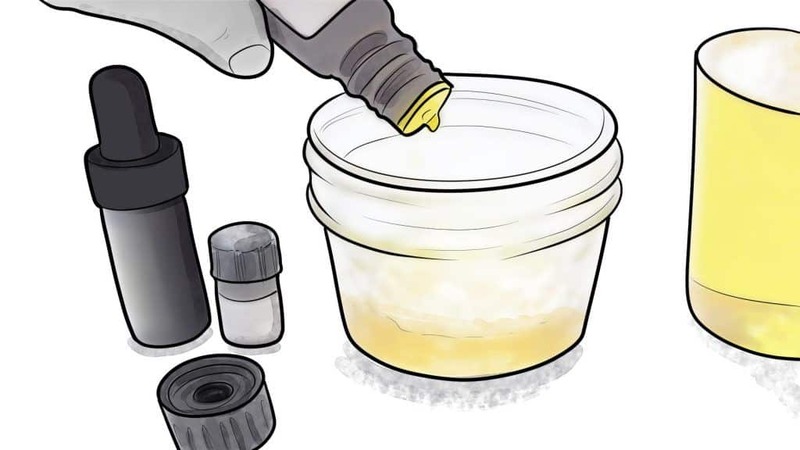 But let’s take a look under the hood at exactly how castor oil works, its benefits, and how it stacks up against other oils commonly used in hair growth products. 1. So, what is it? Castor oil comes from a plant called ricinus communis, which is native to the tropical areas of Africa and Asia. While castor oil has gained popularity in the past few years as a hair and skin product, it has been around for thousands of years and has a long history of use for medicinal purposes. 2. 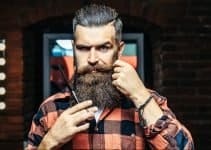 How does it help hair growth? Castor oil contains large amounts of ricinoleic acid – which is naturally anti-bacterial and anti-fungal. And bacteria and fungus dwell in the roots of your hair while stunting hair growth (if not completely stopping it). It also contains omega-6 essential fatty acids which improve blood circulation to the scalp while encouraging hair growth. Meanwhile, it’s rich in essential nutrients that nourish the scalp and strengthens hair roots. To get a bit more scientific, studies show that ricinoleic acid inhibits something called Prostaglandin D2. PGD plays an important role in the development of the male reproductive system, but an overproduction of it causes slow hair growth. 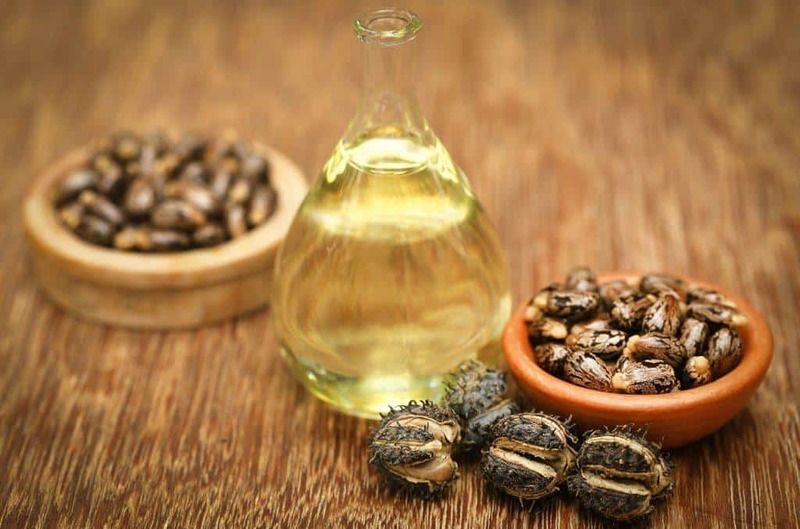 Another castor oil attribute is that it locks in moisture due to its large amount of polyunsaturated fatty acids. The fatty acids adhere to individual hairs to stop moisture from escaping. It also attracts moisture from the environment to further nourish your hair. 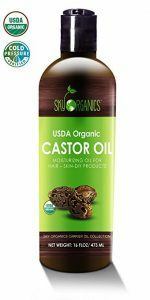 Last but not least, castor oil protects existing hair follicles to limit hair loss. It even protects against environmental factors such as the sun’s harmful UV rays and pollution and fights dandruff. In other words, it packs a pretty powerful punch. If you’re looking to stay “regular,” castor oil can help. We won’t get into too much detail here, folks, but it helps you get the push you need to, well, get the job done. And one study showed that senior citizens who took castor oil experienced decreased symptoms of constipation. User beware, however, because taking too much castor oil may lead to abdominal cramping and diarrhea. The ricinoleic acid found in castor oil reduces inflammation and relieves pain when applied topically. That’s particularly helpful for people with rheumatoid arthritis or psoriasis. Ricinoleic acid is a monosaturated fatty acid that acts as a humectant – which prevents water loss from the outer layer of the skin – to moisturize the skin. You’ll find castor oil in a wide variety of cosmetics, such as lotions, makeup, and cleansers, to promote hydration. Better yet, castor oil often replaces harmful ingredients, such as perfumes, dyes, and preservatives found in moisturizing products. Well, it may not actually heal wounds, but it promotes healing by creating an environment in which healing occurs – including that it prevents sores from drying out. Castor oil also reduces dryness and the buildup of dead cells that delays wound healing. Castor oil has several qualities that may reduce acne symptoms, including that it fights bacterial overgrowth which may lead to acne. Because castor oil also works as a moisturizer, it can help soothe inflamed and irritated skin that often affects people with acne. Castor oil has anti-fungal qualities that can help treat candida, a common cause of serious dental issues, including gum infections. So, all that said, castor oil appears to be something of a miracle drug. OK, maybe not quite a miracle drug, but pretty damn versatile, nonetheless. However, there is potential castor oil for hair side effects, such as scalp itching. Itchiness may occur because castor oil contains triglyceride and 90 percent fatty acid chains that, without getting any more scientific, cause itchiness in some users. It doesn’t happen to a lot of castor oil users, but you may want to put some on your inner arm first to check for potential itchiness. Other symptoms may include a rash, inflammation, dizziness, and trouble breathing, but those symptoms occur almost exclusively in non-hair growth-related uses of castor oil. Like castor oil, coconut oil has many benefits for hair health for a variety of reasons. It’s rich in lauric acid and several essential fatty acids that supply proteins to the hair to help it retain strength and avoid breakage and loss. Coconut oil – again, like castor oil – has antifungal and antibacterial qualities that make it ideal for fighting dandruff and itching. Regular massaging of your hair with coconut oil is said to improve hair follicle health, while it also keeps your hair and scalp moisturized. Many experts agree that castor oil is better than coconut oil for addressing hair loss while coconut oil is ideal for regular hair maintenance. Argan oil comes from trees native to Morocco and has been used for centuries for a variety of things, including cosmetics and hair health. Like other oils, argan oil is most effective after it has gone through the cold-pressing process. And it has many benefits, including that it helps treat high cholesterol while preventing obesity and cardiovascular diseases. We’re primarily concerned with argan oil’s benefits for hair growth, however, and it contains several vitamins and nutrients that increase blood circulation to the scalp. Argan oil moisturizes the scalp while strengthening the hair’s follicles to reduce damage caused by the sun’s UV rays and other elements, as well as shielding them from damage caused by chemicals applied to the hair. Because of its moisturizing qualities, argan oil also protects against itching and dandruff caused by a dry scalp. While argan oil offers many of the same benefits for healthy hair than does castor oil, castor oil is probably better for people with sensitive scalps because it offers even more moisturization than argan oil. Argan oil works well when combined with an exfoliating shampoo that unclogs the pores so that the oil and penetrate them. You’ll find jojoba oil in many skin and hair care products such as shampoos and conditioners. When used on the hair, jojoba oil acts as a “carrier” oil that delivers essential oils to the scalp while aiding their absorption. But there’s more: jojoba oil moisturizes the hair without leaving any residue and resolves the dryness that leads to dandruff and hair loss. And, because it moisturizes hair follicles, jojoba oil makes them stronger, healthier, and potentially more resistant to hair loss. An easy way to use jojoba oil is to mix a few drops of oil in with your favorite shampoo or conditioner. You can also use jojoba oil after shampooing but be wary of using too much because it may leave your hair feeling (and looking) greasy. Sweet almond oil contains oleic acid that deeply moisturizes and regenerates hair follicles. It also has anti-inflammatory properties and mixes easily with the natural oil (sebum) produced by your scalp and skin. Sesame oil combines oleic and linoleic acid and regulates sebum to prevent excessive oiliness. It also contains vitamins E and B, a bunch of fatty acids, and important minerals such as iron, zinc, and magnesium that contribute to better hair quality. The fatty acids contained in avocado help repair hair damage while also improving hair quality. Avocado oil is very helpful if you have split ends or frizzy hair. Avocado oil, like olive oil, may help inhibit the inhibit the enzyme by-product DHT, which is said to be a leading cause of hair loss in men. One thing you’ll notice while researching castor oil for hair growth is how certain brands keep popping up in the “best of” reviews. The truth is, you can probably find a lot of “snake oil” products when looking for the best castor oil, which is why we took a closer look at those that earned high marks from experts. As with most of our reviews, we prefer products made from natural and organic ingredients. Ease of use is also important, as is price, although how much a product costs isn’t necessarily a prime consideration. After all, you can find high-priced products that don’t work and others that work just fine. Perhaps the defining factor for including any product on our best-of reviews is whether it gets results. If it doesn’t or gets mixed reviews from consumers, we tend to look somewhere else. 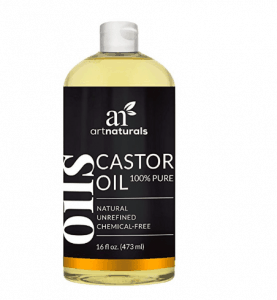 Have you used castor oil for hair growth? If so, what product and what were your results? We welcome your feedback and suggestions and would love to hear from you! confused!! you say use cold-pressed only. ….. but then rank NOW expeller pressed as a top choice. Why is NOW’s expeller pressed ok? thank you!! It’s still good, better that solven extracted and worse tha cold pressed, and it’s cheaper. Can I know what is Ricinus Communis with Castor oil for hair growth ? Is it better to buy castor Oil with Ricinus communis in castor oil. It’s the plant where the Castor oil comes from. Well review on castor oil. Could you please write an epic long article on Avocado Oil. I need more info on this oil. I have been using the Jamaican Black Castor Old for two months and I’m just amazed at how it works. My hair is way stronger, thinker, and it’s an excellent moisturizer. I’m very happy with this product.